The problem with most “best things to do” or “Top 10” lists is that they either only include the popular places you’ve already heard of, or they’re entirely subjective to what the author’s favorite things are. The truth is–everyone has their own favorite corner of Maine. Whether it’s the smell of saltwater and pines, the sound of loons calling out across the lake as you fall asleep, the view from a raft as you “let her drift” down the Kennebec, the exhilaration of snowmobiling across a frozen lake, or the simple feeling of the mild summer sun warming your face…Maine’s allure catches us all in a different way. So I’m not here to tell you what the best things to do in Maine are. Instead, I’m simply giving you some ideas that, I think, will add up to unforgettable adventures in the Pine Tree State. Having called Maine my home until I was an adult and now taking frequent trips “home” throughout the year, a lot of this list draws from my own experience. But it’s also part Maine bucket list, part crowd-sourced from friends and family who shared the places they love to take visitors. 1. Swim on top of a mountain. Tumbledown Mountain near Mount Blue State Park is not only a beautiful hike in western Maine–there’s also an alpine pond nestled between the three peaks where you can cool off on a summer hike. 2. Go island hopping in a sea kayak (and visit the most remote part of Acadia National Park). Merchant Row is a cluster of more than 50 islands that were prized for their granite during the granite boom of the late 1800s and early 1900s. Now two-thirds of these islands are protected in one way or another. With so many of the islands being open to the public, this is a sea kayaker’s paradise. Experienced kayakers can put in at various public launches around the island and set off on their island-hopping adventure, while beginners can opt for a guided trip with one of several outfitters on the island (like Driftwood Kayak). 3. Hike to great heights. While Maine’s highest peaks may not rival the Rockies, mountain lovers will find some gems in inland Maine. Climb to the top of a fire tower, take the Moosehead Pinnacle Pursuit challenge, tackle Maine’s 4K+ footers in the Maine High Peaks region, or hike a rare mature forest at Borestone Mountain. And of course, scale the highest mountain in Maine: Katahdin. Since it’s the northern terminus of the Appalachian Trail, you can witness thru-hikers reaching the end of a 2,000-mile trek if you time it right. 4. Stop and smell the flowers at the Coastal Maine Botanical Gardens. They’re the largest botanical gardens in New England! 5. 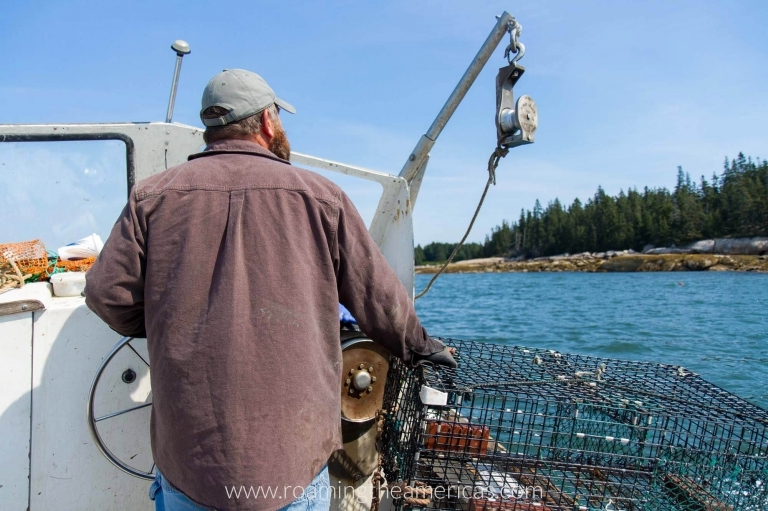 Listen to a lobsterman’s tales. While I’ve only actually met one lobsterman, and I should avoid making generalizations…he was, indeed, exactly what I imagined a lobsterman would be like: bearded and full of ocean tales. The farther you travel off the beaten path, the more likely you’ll be able to meet everyday working Mainers, like those whose livelihoods depend on lobstering. But in case you don’t serendipitously encounter a lobsterman, there are lobster boat tours from several towns on the coast (like Lulu Lobster Boat and Captain Jack’s Lobster Tours). Maine has 3,500 miles of coastline and its ocean waters are host to many types of whales–Humpbacks, Finbacks, Minkes, and more–making whale watching a favorite summer activity. 7. Search for abandoned locomotives in the North Maine Woods. 8. Take a Maine windjammer cruise. 9. Catch a summer concert at the Bangor Waterfront. Listen to everyone from Pentatonix to Train to country music stars whose names I don’t know. Plus, check out the annual American Folk Festival, which draws close to 100,000 people over the course of three days in August. Head out to the flats when the tide is low and dig into the mud for your dinner! Well, there’s a little more to know than that (like getting license from the town hall and not cutting your hands), but clamming is a fun thing to do in Maine with kids (or without!). 11. Immerse yourself in Wabanaki culture and history. There are four Indigenous groups in what is now known as Maine that are collectively known as Wabanaki, which means “People of the Dawnland.” Waterways like the Penobscot and Kennebec rivers, which bear their original Wabanaki names, were significant transportation routes for the Wabanaki peoples. Learn more about their history and culture with an immersive Ways of the Wabanaki canoe trip, guided by a Native Penobscot (Jason Pardilla) together with Mahoosuc Guide Service. 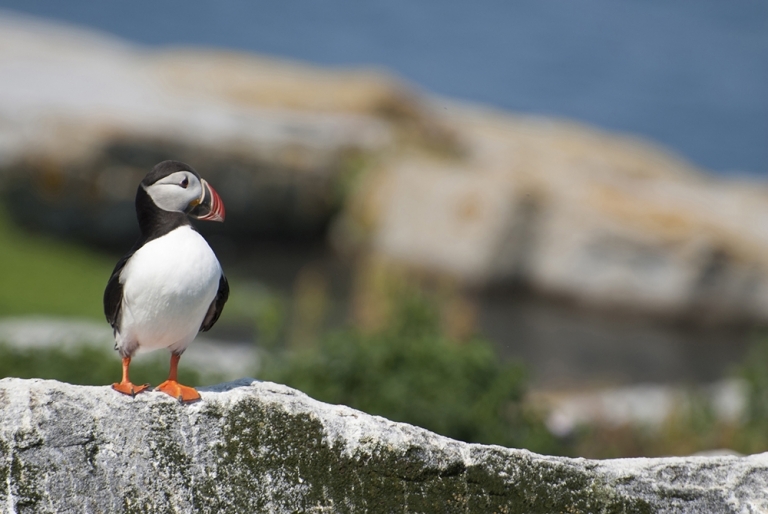 There are several Atlantic puffin colonies on islands off Maine’s coast, and you can head out on a small tour to view them. 13. Shiver on a summer hike inside ice caves. Near Mount Katahdin in Debsconeag Lakes Wilderness Area, you’ll find ice caves that stay frozen year round–offering “nature’s air conditioning” during the summer. Native Americans even used these caves to preserve meat and pelts. 14. 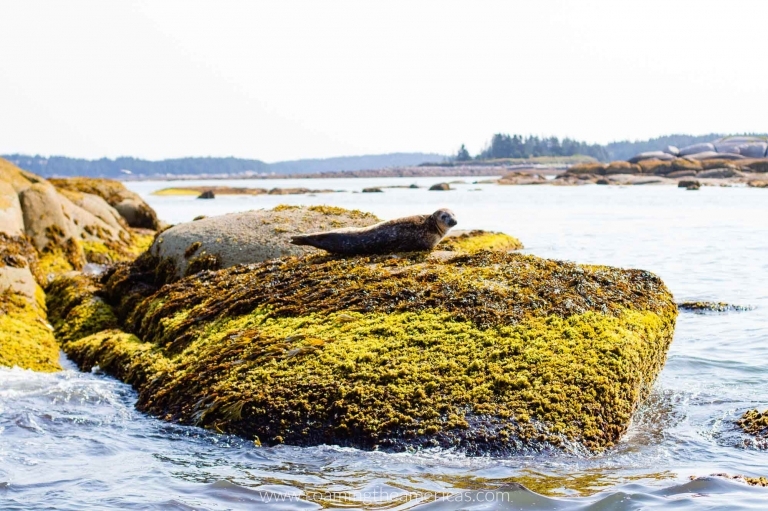 Watch for seals at Cobscook Bay State Park. 15. Take photos of lupines. There’s something ever-so-summery about wildflowers. As warmer temperatures are just starting to settle in, and before the ubiquitous Queen Anne’s Lace makes her appearance, Maine enjoys a gorgeous display of pink and purple wildflowers in mid-June: the lupines. 16. Hike the entire hut-to-hut trail system with Maine Huts & Trails. 17. Tackle Maine’s most epic whitewater. If you want to head inland but still crave thrashing waves, whitewater rafting on the Kennebec, Penobscot, or Dead River is where it’s at. There are even some parts that kids (and those less adventurous) can do. Rafting the Kennebec was one of my favorite things to do in Maine growing up, and it definitely makes my Maine Top 10 list! Check out Northern Outdoors for trips on all 3 rivers (it’s where my dad did his guide training!). 18. Bike the carriage roads in Acadia National Park. Then eat some popovers on the lawn at Jordan Pond House! 19. Spend lazy summer days at the lake. Maine summers aren’t complete without heading “upta camp.” Translation: going to a cabin on a lake. Days at the lake are simple, spent skipping rocks and doing cannonballs, listening to the echoes of loon calls floating across the water, and screen doors creaking and slamming. There are plenty of camps for rent on one of Maine’s 6,000 lakes and ponds. 20. Take a summer art walk. From Portland to Presque Isle, and Bangor to Bar Harbor, there are art walks in downtown areas all over Maine during warmer months. There are over 100 varieties of apples grown in Maine, and apple picking is as much of a fall activity as leaf peeping! Make sure you try some fresh apple cider while you’re at it–either cold or hot with spices, there’s nothing like it in the fall. One of my favorites is Treworgy Family Orchards near Bangor. Take a hayride and challenge yourself with a corn maze to make a day of it! 22. Drive through blueberry barrens in the fall. While the rest of the world is thinking about leaf peeping in New England, those in the know take a drive through the fiery fields of low-bush blueberries that define the landscape of Downeast Maine. 23. Take in stunning foliage from above. Get expansive views from the Height of Land Overlook, Attean Overlook on Route 201, Caterpillar Hill near Deer Isle, Penobscot Narrows Observatory Bridge, or Mount Kineo (be ready to climb the firetower!). What is the best time to visit Maine? Head here for my month-by-month guide! 24. Slide through pine-filled woods on cross country skis. Want some human-powered winter adventure? Head out on more than 90 miles of groomed ski trails from the Appalachian Mountain Club’s wilderness lodges. Besides experiencing the snowy landscape at a slow pace, the best part might be coming back to a toasty fireplace. Is there anything better than a cozy cabin in the woods during winter? 25. Try your hand at ice fishing. When Maine’s 6,000 lakes and ponds freeze over during the deep of winter, there are plenty of ice fishing opportunities. Head out on a remote lake with a registered Maine guide who can take care of all the equipment. 26. Ride down a snowy hill on a toboggan. 27. Savor the stillness of winter as you snowshoe through the forest. Maine winters may be bitterly cold, but there’s something absolutely serene and beautiful about getting outside anyway. Listen to the trees creek and the snow crunch under your feet as you snowshoe from hut to hut in the Carrabassett Valley with Maine Huts & Trails. 28. Zigzag around the state on a snowmobile. Don’t scratch your head if you hear grown men with thick Maine accents talk about going sledding. They’re not about to take a flying saucer down a snowy hill. It’s heading out on Maine’s 14,000 miles of groomed snowmobile trails they’re all giddy about. This is a favorite winter sport for Mainers, and there’s plenty of opportunity for visitors to rent sleds or go on a guided trip–head west or north for the best snowmobiling in Maine. RECOMMENDED: Check out Northern Outdoors in The Forks or New England Outdoor Center in Millinocket. 29. Eat or stay inside a repurposed mill. Textile and paper mills were part of the fabric of Maine’s economy and culture for generations, and while many of them have shut down, some are being repurposed–bringing new life into small towns. 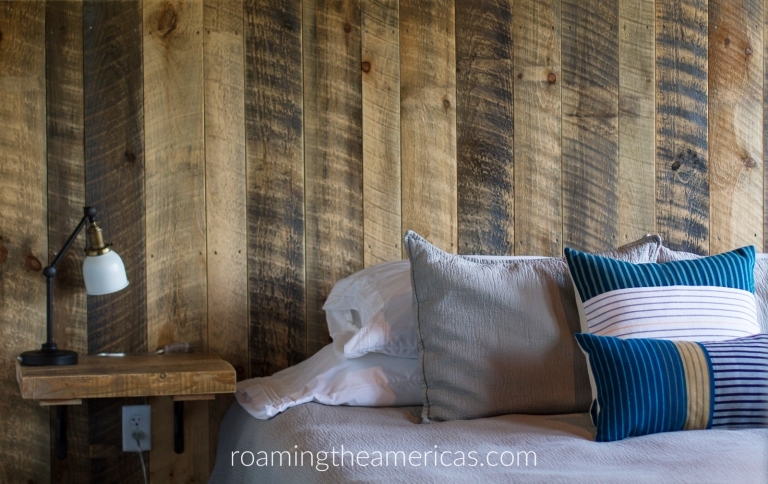 In Dover-Foxcroft, you can eat and stay at The Mill Inn + Cafe–it’s a great in-between point for those heading to Moosehead Lake or Peaks Kenney State Park. In Brunswick, the old Fort Andross mill houses a huge antique shop, a winter market, and Frontier, a restaurant featuring a locally sourced menu with tables overlooking the water. Or head to Bates Mill in Lewiston to take a brewery tour at Baxter Brewing or eat on the patio at DaVinci’s. RECOMMENDED READING: I love the Explorer’s Guide Maine for a travel guide that covers the whole state! 30. Learn to sail at the Wooden Boat School. Ever wanted to become a sailor? If you’ve recognized the fact that it’s going to take more than a little extra cursing, you might be ready to put in the work to learn actual sailor-y skills. Head to the little town of Brooklin for a 5-day hands-on sailing course at the Wooden Boat School. There are even family courses available! 31. Geek out over Stephen King with a tour of Bangor. Bangor is not only the city that he’s called home for a few decades, it’s also the inspiration for the fictional town of Derry. Fans of the fiction writer can take a tour (SK Tours of Maine) of many significant spots around town–including seeing the outside of his creepy house. 32. Visit the last active Shaker community in the world. The Shakers were an offshoot of the religious group called Quakers, and they migrated to America in pursuit of religious freedom in the 1700s. Sadly, they experienced some persecution here as well, but survived and eventually grew in number to about 5,000. In 1783 the Sabbathday Lake Shaker Village was established in New Gloucester, Maine. Today it is the only active Shaker community remaining, and it is open to the public–even for Sunday meetings. You can also explore some of the 1,800 acres of land on a guided nature hike. 33. Spend a few days strolling an adorable coastal town. 34. Catch the first sunrise in the United States. On Cadillac Mountain in Acadia National Park, you’ll be joined by a slew of other cars driving to the summit in the wee hours of the morning–all in pursuit of seeing the first sunrise in the USA. But (shhhh…you didn’t hear it from me) all those people aren’t actually seeing the first rays of sunlight if they’re visiting in the summer. Because of the way the earth changes position, there are 3 places in Maine that can claim the “first sunrise” title throughout the year: Mars Hill (March 25 – September 18), West Quoddy Head (around the spring and autumn equinoxes), and Cadillac Mountain (October 7 – March 6). 35. Get a selfie with a giant boot. Yes, it’s perfectly touristy. But L.L. Bean really is a staple in Maine (I always had L.L. Bean book bags in school). The flagship store in Freeport is a great place to stop and make sure you’re stocked up on outdoor gear–and get a Bean Boot photo while you’re at it. 36. Find your way around the world at the world traveler sign. 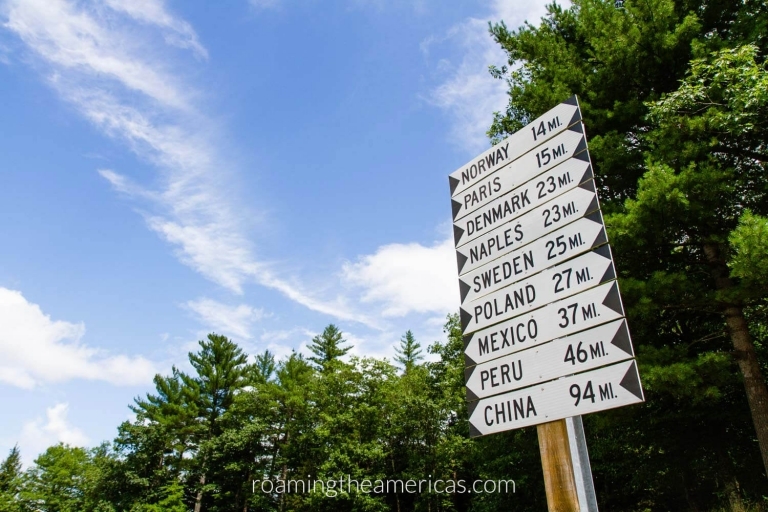 Paris–15 miles, China–94 miles, Sweden–25 miles, Mexico–37 miles…just another day in small-town Maine! It might be a little confusing to ask for directions around here, but that’s where this helpful (ahem, quirky) road sign comes in. You’ll definitely want to pull over for this one. 37. Go to the fair. From summer through fall, fair food meets farm show as agricultural fairs pop up for a few days at a time throughout Maine. The Common Ground Country Fair in Unity is a little on the healthier side (sponsored by the Maine Organic Farmers and Gardeners Association) and has everything from an herb tent to a fiber market to handcrafted Native American baskets. Plus, they compost and recycle–because 60,000 people produce a lot of waste! This fair is also the birthplace of the viral video of Maine’s “moose poop lady,” as I affectionately call her (seriously, I’ve never been prouder to be a Mainer — I love this). 38. Stop at Indian Hill Trading Post. On your way to Moosehead Lake, this is a must stop for a little taste of Maine woods life–plus any supplies, groceries, or gas you need. 39. Drive across the only granite cribwork bridge in the world. Bailey Island Cribstone Bridge, connecting Orr’s Island and Bailey Island, is built of granite slabs put together in a lattice fashion with spaces in between (and no cement!) that allow the ocean tide to pass through. Built in the 1920s, it has stood the test of time and is a historic civil engineering landmark. 40. Stand in the shadow of Paul Bunyan. 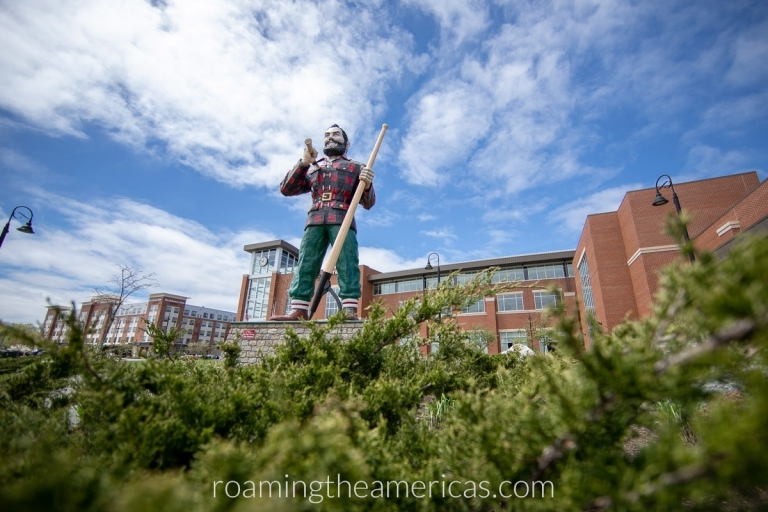 Standing proudly at 31 feet tall, this statue of the lumberjack legend has been a local landmark for more than half a century in downtown Bangor. It’s a fun road trip destination that Mainers are proud to call theirs–just don’t try telling anyone he’s really from Minnesota. 41. Follow the Maine Ice Age Trail. Whether you’re a geology nerd or not, the Maine Ice Age Trail is a fascinating resource for learning more about the unique glacially-formed landscape of coastal Maine. 42. Taste the “buttery, flaky crust” at Dysart’s. Yes, I’m telling you to go to a truck stop on I-95. But it’s not just for truckers–locals actually go here to eat (admittedly, I always felt like an anomaly growing up in the Bangor area telling someone I’d never been there, an ailment that has been rectified in my adult years). Even if you’re not from Maine, you may have heard of Dysart’s if you saw the blooper reel that went viral a couple of years ago with an older couple trying to say “buttery flaky crust” for one of their commercials. 43. Chat with locals at a general store. While the general store in Maine may not be as ubiquitous as other areas of New England (I’m looking at you, Vermont), it’s still part of the small-town landscape in many places. Stop in, peruse the selection of fishing bait and wine, grab a bite to eat, and listen to the Maine accent in the wild. 44. Practice your French on a road trip through St. John Valley. Did you know that Maine’s largest minority language is French? Head to the borderlands with Canada and you’ll have the opportunity to speak French (though English is also spoken). In some towns bordering Quebec, the percentage of people who speak French in their home well over 50%. 45. Pan for gold in the Swift River. Confession: this made the list because it was a childhood dream of mine, and we just never got the chance to do it. Prospecting for gold is still a thing in western Maine, and it’s still very much on my Maine bucket list. 46. Check out Moxie memorabilia at the Matthews Museum. Even though this drink wasn’t actually invented in Maine, it’s been adopted as the Maine state soft drink. This museum (open seasonally) has a wing devoted to Moxie. Okay, it’s not technically a desert, but this little spot near Freeport is an unusual attraction and one of Maine’s most famous natural(ish) phenomena. The Desert of Maine is a result of modern farmers not properly rotating crops, causing erosion that eventually uncovered 40 acres of glacial silt. While it may be a little tourist trappy (think camel statue), it’s still an interesting thing to do in the Pine Tree State. 48. Learn to talk like a Mainah. There’s more to it than you may think, but replacing “really” with “wicked” is a good start. Ayuh. RECOMMENDED: Check out Down East’s Maine dialect guide here. Most visitors coming to Maine want to see a moose before they head home–there’s a bit of intrigue and mystery in spotting one of these majestic (if somewhat clumsy) creatures. The moose population in Maine is estimated to be around 76,000, making it the highest population in the United States outside of Alaska, and inland Maine is prime moose scouting territory. 50. Take a selfie at Mile 1. Head to “America’s first mile” on Route 1, which stretches the length of the East Coast all the way to Key West, Florida. 51. Meet the Duck of Justice. For fans of the Bangor Police Department’s viral Facebook page, meeting the Duck of Justice is a fun (albeit quirky) road trip stop. 52. Snap a photo of the quirky sign at Bishop’s Store in Jackman. Maine has a thing for funny signs, apparently. If you’re taking the Old Canada Road Scenic Byway, this is definitely worth a stop. 53. See farm country from above in a hot air balloon. Aroostook County has been home to the start of two famous transatlantic balloon flights. Each year, more than a dozen colorful balloons launch into the sky in Maine’s largest county during the Crown of Maine Balloon Fest. 54. Take a dirt road…get lost*…and find your way out with an atlas. While not predictable or necessarily fun, this promises to be unforgettable. My family still tells the tale of “our favorite road” (sarcasm intended), which my dad thought looked like a shortcut. Ideally, you won’t actually get lost–it’s more about having a sense of adventure and exploring where the atlas takes you. *Do at your own risk. RECOMMENDED: The one and only atlas that Mainers rely on is the DeLorme Atlas and Gazetteer. It’s an absolute essential for getting off the beaten path in Maine (dirt roads or not)! 55. Try a red hot dog*. While I personally don’t see the appeal, they are decidedly a thing. There’s even a red hot dog festival. *Do at your own risk. 56. Walk to an island. While most people will tell you about walking to Bar Island at low tide from the ever-busy Bar Harbor, there’s another island-from-an-island walk in the area. Head to Barred Island Preserve from Deer Isle for a quieter hike with beautiful views. Anyone from Maine knows about fiddlehead season–a short time in spring when the still-rolled-up fronds of a baby fern (called fiddleheads before they unfurl) pop up everywhere. They’re harvested (read: “Pull over, dear! I see some fiddleheads!”) and cooked as a vegetable dish. While they may never receive the acclaim that lobster does, they’re still much a part of Maine life in the spring. If you don’t want to try foraging for them yourself (it’s important that you can clearly identify any wild plants you pick), you can try a local chef’s take on this rustic delicacy. 58. Try a whoopie pie at the Whoopie Pie Festival. Maine may or may not be the birthplace of the whoopie pie (it’s apparently hotly contested), but Mainers love it enough to make it the official state treat–whatever that means–and give it a festival. So you should probably eat one while you’re here. 59. Eat a lobster roll on the docks. At Young’s Lobster Pound in Belfast, it’s BYOB, and it’s a perfect spot for a picnic on the docks with fresh-as-it-gets lobster rolls. 60. Turn your hands (and tongue!) purple as you pick wild blueberries. Maine has the largest wild blueberry crop in the U.S., and picking blueberries is a Maine summer rite of passage. There aren’t many pick-your-own commercial operations, but wild blueberries grow in a lot of places around the state (not just on the coast!). As long as you’re certain you can identify them, pick away if you’re on public property. RECOMMENDED READING: If you’ve got kids, Blueberries for Sal is a must read! 61. Taste fresh maple syrup. Vermont might get all the attention for maple syrup, but Maine deserves its own recognition for this sappy goodness, too. Every year on the fourth Sunday in March, sugar houses across the state open to the public for Maine Maple Sunday–offering maple syrup samples, demonstrations, and more. 62. Eat a potato donut at The Holy Donut in Portland. All the way from the northern reaches of Maine to the big city of Portland, Maine potatoes are the “secret” ingredient making everyone rave about these donuts. 63. Warm your bones in the winter with seafood chowdah. These chocolate-covered coconut confections invented in Maine have a surprising ingredient: the humble potato. (Although it may not seem that unusual to Mainers, considering Maine was once the top potato producer in the nation). Nobody is sure exactly what the story behind Maine Potato Candy is, but they’ve stuck around for generations. 65. Taste the fresh blueberry pie at Helen’s. A drive to Machias just for this pie is entirely worth it. It’s that good. If you are able to somehow ignore all the other pastry options, you’ll have your pick of two types of wild blueberry pie: the traditional two-crust baked blueberry pie, or a to-die-for seasonal blueberry cream pie (a cooked bottom crust filled with a mountain of fresh, uncooked berry filling topped with whipped cream). With your grandkids…or your kids…or any kid! This was a one of my favorite things to do on the lake with my grandpa when I was a kid. Maine has tons of excellent freshwater to choose from–whether you want to go fly fishing or regular old spin fishing. 67. Drive through the solar system in Aroostook County. Maine’s northernmost and largest county is nicknamed “The County”–whether it’s just easier to say or because it makes you feel like nothing else in the world exists when you’re there, I don’t know. But The County’s potato fields, rolling hills, and wide open spaces are the perfect setting for a built-to-scale model of the solar system. Stretching 40 miles from Pluto to the sun, it’s the largest complete 3D scale model of the solar system in the world. The historic walking trails and nature preserve at Vaughan Woods feel a little extra magical when you know the local nickname. But despite their resemblance to a fictional world, you won’t find any hobbits here (though that doesn’t mean you can’t tell your kids fanciful tales to ignite their imaginations). Still, you’ll love exploring the stone bridges, waterfalls, and wild meadow at Vaughan Woods. Please be a Leave No Trace visitor by respecting the wild feel and not altering the natural landscape of the woods (I’m looking at you, tiny-stick-structure-builders). 69. Hike into the B-52 crash site. Near Moosehead Lake, you’ll find a memorial to the seven U.S. Air Force men who lost their lives in 1963 when their B-52 plane crashed while out on a routine training mission. Head to the Moosehead Lake Aviation Museum to learn more before taking the short walk into the site. 70. Find your hometown on Eartha, the world’s largest rotating globe. Okay, you can’t really find your hometown–it’s not quite that detailed. But it’s still worth a stop. This 41-foot rotating globe is easy to spot from the interstate, but you can also go inside the building to see it in person (a great kid-friendly, free attraction). It was opened in 1998 by the map company DeLorme–the atlas makers with a cult-like following in Maine–and despite being acquired by Garmin, the giant globe that DeLorme constructed is still open to the public. 71. Get your hands (and Bean boots) dirty at Wolfe’s Neck Farm. Independent farms in Maine are trending the opposite direction from most of the country: they’re growing in number. At Wolfe’s Neck Farm not far from the busy shopping streets of Freeport, they’ve got a mission to “transform our relationship with farming and food for a healthier planet.” This family-friendly (but not-just-for-kids) coastal farm has plenty to do for a day: bike down country roads, kayak the calm Casco Bay waters, enjoy the Farm-to-Table chef dinner series, bird watch on nature trails, camp oceanfront, and of course, visit the animals and gardens. It’s hard to believe that this place is free and open to the public year round. Bonus: If you’re in town longer, head to nearby Wolfe’s Neck Woods State Park for more scenery and nature trails. On Bailey Island, you’ll find a curious rock formation that look like a huge staircase–made for giants. It’s a short, family-friendly walk to get there. 73. Learn about Maine’s history in the Underground Railroad. In 1828 the Abyssinian Meeting House was incorporated in Portland, two years after six African American men wrote a letter to the editor condemning the segregation and racism they faced in the Second Congregational Church. 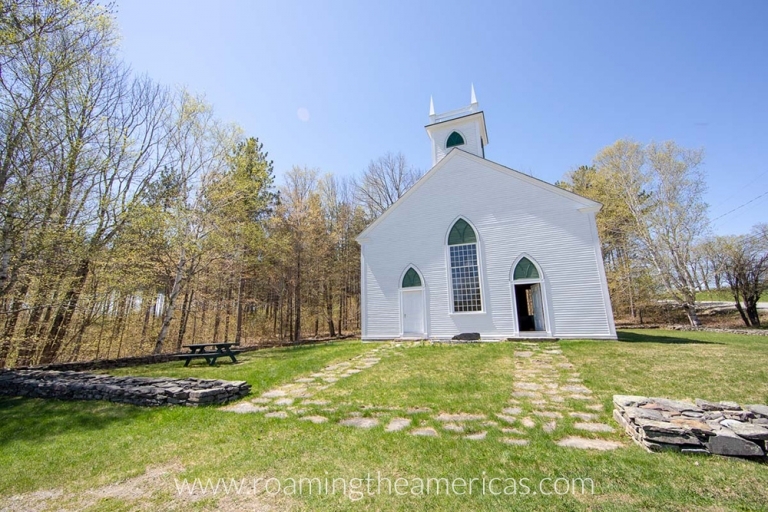 The meeting house served as the hub of African American life for 86 years, and it was also an important part of the Underground Railroad in Maine. It’s currently undergoing ongoing restoration efforts and is only open to the public through the India Street tour with Portland Landmarks, which was offered in 2018 partnership with the restoration committee (currently planned for 2019). You can also view the meeting house and more on the self-guided Portland Freedom Trail walking tour (PDF guide here). Additional stop near Bangor: There’s a small park in Brewer, Maine with an Underground Railroad memorial called “North to Freedom” (located at Chamberlain Freedom Park). 74. Visit the only international park maintained by two governments on a two-nation vacation. Roosevelt Campobello International Park is located on Campobello Island in Canada, just over the bridge from the cute village of Lubec. You can take a free tour of Franklin D. Roosevelt’s historic summer home and grounds, and go off exploring some of the scenic overlooks or nature trails. This is also the world’s only international park operated jointly by two governments. RECOMMENDED READING: If you’ve got kids, pick up Remember Me: Tomah Joseph’s Gift to Franklin Roosevelt by Passamaquoddy author and historian Donald Soctomah. 75. Step inside the South Solon Meeting House. Maine is full of white clapboard churches, but there’s something unexpected inside this one. Built in 1842 for religious and community activities, it later suffered the same deteriorating fate as many meeting houses of its era. Part of the preservation efforts included painting floor-to-ceiling frescoes in the 1950s. Even if you’re not an art fan, this is well-worth a road trip stop. 76. Visit prehistoric shell middens in Damariscotta. If you’re anything like me, you might be wondering: what in the world are shell middens? Basically, they’re heaps of shells that were discarded in one place over long periods of time–in this case, oyster shells discarded by Native Americans. There are many shell middens on Maine’s coast, and they tell an important piece of Native American history. Although many of the shells have been destroyed (processed for chicken feed by Europeans), the Whaleback Shell Middens are one of the largest intact middens on the entire East Coast. 77. Take an art road trip. The Maine coast has beckoned artists for a long time, and it’s not uncommon to find artist studios and lobster traps in the same coastal villages. Whether you want to explore the Maine Art Museum Trail or visit some of the amazing galleries, the Maine coast has plenty to offer. 78. Connect with Wabanaki culture at the Abbe Museum. The Abbe Museum is not only Maine’s only Smithsonian Affiliate, it’s also one of the best places to learn about both the history and contemporary cultures of Native peoples in what is now known as Maine. History buffs (including curious kids!) will love visiting the several transportation museums in Maine: Owls Head Transportation Museum, Cole Land Transportation Museum, Boothbay Railway Village, and Seashore Trolley Museum, which is the largest and oldest museum of public transportation. 80. Learn about Maine’s logging history. Okay, logging history might not seem very interesting. I get it. But given that Maine is 90% trees, the lumber industry is an important part of its history and economy. In fact, Bangor was once known as the “lumber capital of the world” and some of the homes of lumber barons still stand. It’s all quite fascinating when you think about connecting with the story of a place! Take a history tour of Bangor, visit the Leonard’s Mills living history site, or take a drive down Route 201, stopping at the markers along the way (which include information about everything from wildlife to Benedict Arnold to driving logs down the Kennebec River). 81. Visit one of the most significant homes from the American Revolution. Burnham Tavern in Machias is the site where the first naval battle of the American Revolution was planned in June of 1775. 82. Drive over a historic covered bridge. Maine once had more than 120 covered bridges, but today there are only nine left across the state. Still, covered bridges are perfectly New England and they’re worth driving a bit out of your way for. My top pick for said relaxation? Cathedral Pines Campground in Eustis. 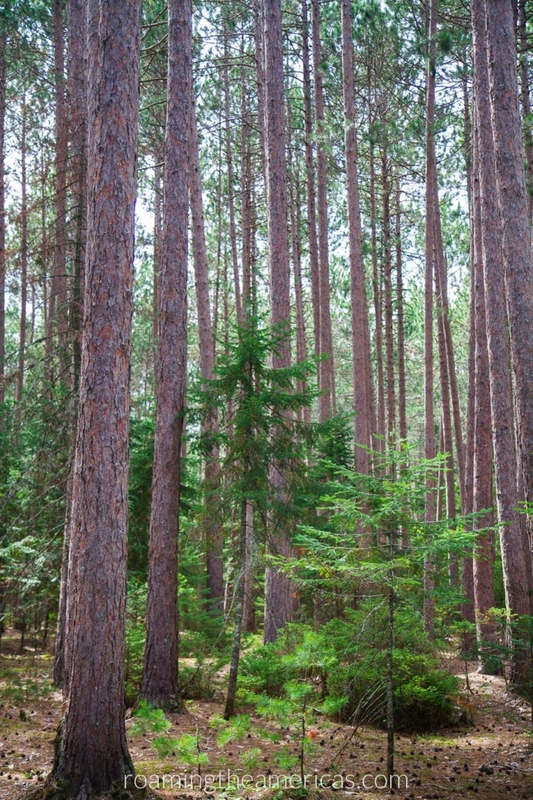 As the name implies, it’s located in a forest of towering red pines. Bonus: Cathedral Pines is located on the shores of Flagstaff Lake–fascinate your kids with tales of the town that was buried under this man-made body of water! 84. Explore Maine’s coastal preserves. While Acadia National Park is the darling of Maine, there’s something to be said about getting away from the crowds to enjoy more nature and less people. And along Maine’s thousands of miles of coastline, there are enough preserves and public land to fill a summer-long itinerary. Camp out on the largest uninhabited island on the eastern seaboard (Marshall Island). Backpack or day hike the Bold Coast Trail, which has miles of oceanside trails. Or hike Great Wass Island to explore rare plants and enjoy gorgeous views. LEARN MORE: Check out Maine Coast Heritage Trust and The Nature Conservancy. 85. Take a waterfall road trip in search of Maine’s best swimming holes. One of the absolute best things to do in Maine in the summer is find waterfalls and swimming holes! 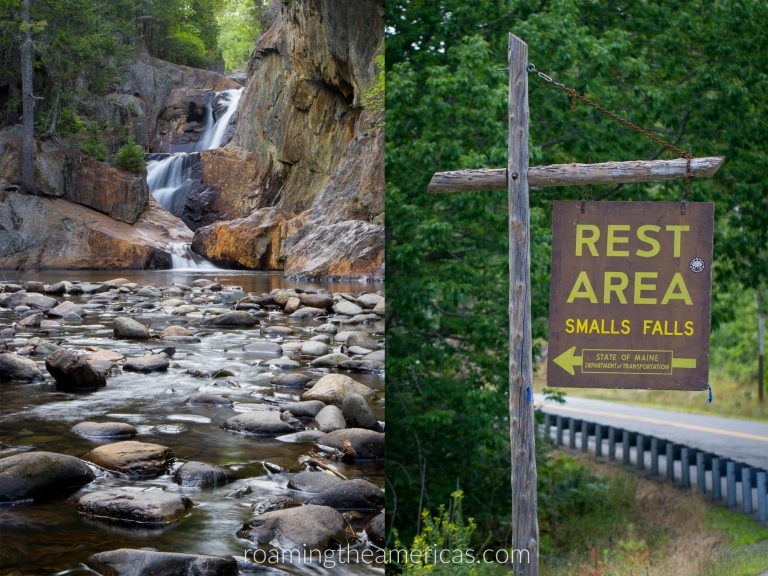 Whether you hike deep into the woods, enjoy a picnic at a rest area, or pull over to the side when you see an inviting stream, western and northern Maine are a dream for freshwater lovers. A few fan and personal favorites: Bickford Slides (AKA Rattlesnake Flume), Coos Canyon, Smalls Falls, Little Wilson Falls, Angel Falls, Katahdin Stream Falls, Step Falls, Grafton Notch, Houston Brook Falls (near Bingham), The Cataracts, and Frenchman’s Hole. 86. Enjoy views from the tallest bridge observatory in the world. At the Penobscot Narrows Observatory Bridge, you can see mountains, lakes, and Penobscot Bay from 420 feet above the river. Plus, history lovers will enjoy stopping by the adjacent Fort Knox State Historic Site, one of the best preserved forts in New England. Find rates and hours here. 87. Go in search of the Northern Lights. While Maine may not be the prime spot to catch the Northern Lights (I’ve seen them just once when I was a teenager), they do show up from time to time. For a better chance of seeing the Aurora Borealis, head to the wide open skies of Aroostook County and other remote parts of inland Maine. 88. Take a ride in a float plane at Moosehead Lake. Seeing the Maine woods from above is breathtaking, and Moosehead Lake is a favorite take-off point. There’s even an international seaplane fly-in every September! 89. Stay at a B&B. One thing’s for sure: New England knows how to do bed and breakfasts. From charming country B&Bs to beautiful coastal inns (like The Keeper’s House Inn on a quiet island), Maine has plenty of options, each one unique. 90. Flex your muscle with a photo at Pockwockamus Rock. About a mile from the south gate of Baxter State Park is a classic photo stop: a boulder with a mural that says, “Keep Maine beautiful” (with Mount Katahdin looming in the distance). 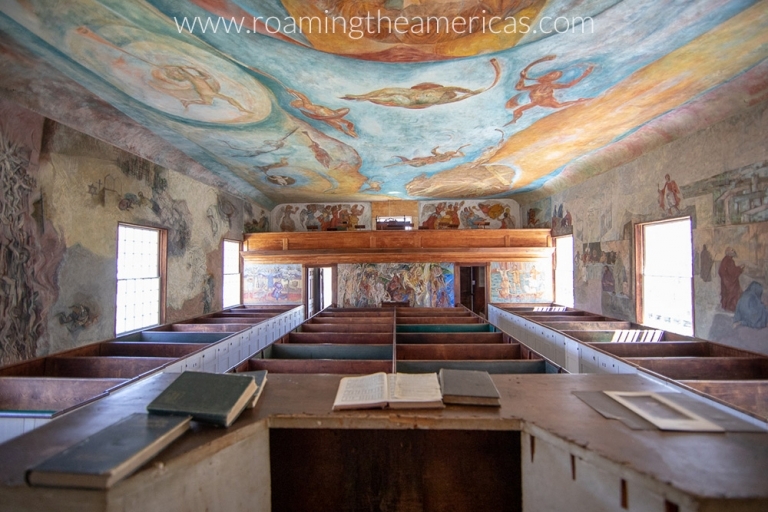 It was painted in 1979 by campers at a conservation camp who were tired of seeing graffiti, and it’s been maintained beautifully ever since. 91. Try to find the most picturesque lighthouse in the state. 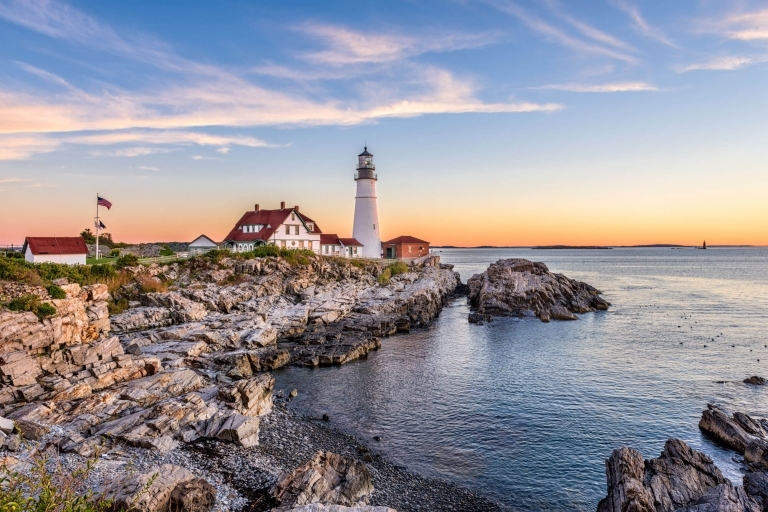 While you may not be able to see the more than 60 coastal lighthouse in one trip, include a few photo-worth ones on your itinerary–and learn a bit about Maine’s maritime history along the way. 92. Take a drive on a scenic byway. When it comes to gorgeous scenery in Maine, the options are numerous: there are 10 Maine Scenic Byways, 3 National Scenic Byways, and 1 All-American Road located in Maine. On the Old Canada Road National Scenic Byway, stop at the various pullouts to learn about the history and wildlife of the Kennebec Valley. The Bold Coast Scenic Byway will take you through blueberry barrens and coastal fishing villages. Explore them all here. 93. Drink some Moxie (soda) while you hike to Moxie (falls). Okay, maybe skip the soda part. It’s overrated…but the falls are definitely worth the drive. Moxie is a classic Maine waterfall hike! It’s also pretty short and an easy hike for kids. 94. 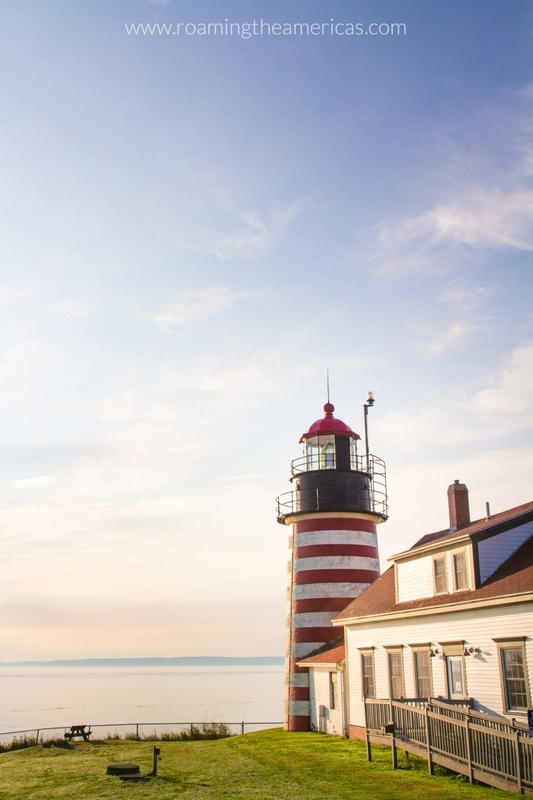 Visit the easternmost point in the continental U.S.
West Quoddy Head Lighthouse is definitely off the beaten path in Maine…But it’s worth the drive to visit the only candy-striped lighthouse in the United States AND the easternmost point in the continental U.S. The lighthouse is located in Quoddy Head State Park, and there are several short hikes here to enjoy as well–some with spectacular ocean views. 95. Paddle your way through the Maine woods. If you’re looking for a remote nature experience, canoeing the Allagash Wilderness Waterway is perhaps one of the best ways to get it. Part of the Northern Forest Canoe Trail (a 740-mile water trail stretching from New York to Maine’s north tip), the state-protected Allagash is a rare waterway that flows north. 96. Go stargazing in a dark night sky. Given the fact that Maine is the most sparsely populated state east of the Mississippi, it’s easy to imagine that there’s not a lot of light pollution (or any pollution, for that matter). And especially as you head inland and north, there are huge expanses of dark night sky. (The Portland Press Herald reported that Maine has the largest swath of dark night sky in the eastern US!) Even if you don’t head inland, the stargazing is stunning in most places in the state, and Acadia National Park hosts the Acadia Night Sky Festival every September. Part of the 100-mile wilderness (the longest stretch of uninterrupted wilderness on the Appalachian Trail), Gulf Hagas is a stunning waterfall hike located in the heart of Maine. 98. Take a leisurely drive around Mount Desert Island. This is one of my favorite things to do when visiting Acadia National Park. While Bar Harbor is charming, the island’s quieter towns are every bit as lovely. Take a map, don’t plan much, and see what catches your eye as you drive–you’re on an island, so you can’t manage to get that lost. 99. Explore Katahdin Woods & Waters National Monument. 100. Watch tidal falls reverse before your eyes. Maine is the only place on the East Coast of the US with the rare phenomenon of reversing falls (also called tidal falls). There are eight places where freshwater meets the ocean and you can watch the rapids reverse as the tide changes–sometimes waves, whirlpools, and “waterfalls” form as well. Check out Sullivan Falls and Blue Hill Falls in the Acadia National Park area, and farther Downeast you can see more dramatic tides at Pembroke Falls (in Reversing Falls Preserve). 101. Go in search of hidden spots and locals’ favorites. Contrary to popular belief, not everything is on the internet. There are still some things that only locals know about (like an epic waterfall hike someone in The Forks told me about–that’s not even on the DeLorme Atlas!). I think there’s some magic to leaving your trip open to spontaneity and exploration. If you’re a visual person like I am, it helps to see these things on a map! I’ve done my best to include most of what’s on this list in a custom Google map below. PLEASE NOTE: The purpose of this map is to show generally where things are throughout the state. Not all points are at their precise location (because Google Maps is often wrong, especially with hiking trail heads), and I recommend consulting an atlas and/or hiking guide for directions. Additionally, I’ve divided these into layers for seasons, but it’s not an exact science. Many of the “summer” activities can easily spill over into spring or fall, and vice versa. Some businesses are only open seasonally or change their hours throughout the year–please check the website or Facebook page for current business hours. Which attractions, food, or Maine adventures would you most love to check out? What else would you add to the list of unforgettable things to do in Maine?